I'd set my alarm clock twice over the 'festive' season and twice rolled over and gone back to sleep rather than schlep over to the Trent. But yesterday was different. There were fish to be caught and getting up at four thirty was no problem! Arriving well before first light with the river about five feet up and coloured, but obviously dropping, I picked a crease swim on the edge of a slack, but in the light of day I wasn't feeling confident so moved downstream to a point where the crease was further out and the flow seemed a reasonable strength close in. Below this swim the inside line pace picked up, above it was the slacker water. The water temperature was 7.4c on starting and by the time I moved it had already risen to 7.5c. Conditions looked good with the overcast, but bright, sky. The upstream rod, cast on the slow side of the crease, produced a couple of small bream early on, but apart from an odd tremble on each rod nothing else happened. The downstream rod was further out, but still on the slacker side of the crease. Late in the morning a fish, looked like a small barbel, rolled straight out on the edge the main flow. Eventually I decided that it was worth trying to hold a bait out in the stronger current. The pulls and rattles started almost straight away, and soon after the tip pulled over. The first fish of the year was in the net and on the scales. First bounce and it did it - then the needle settled back at 9-14. I wasn't complaining though. 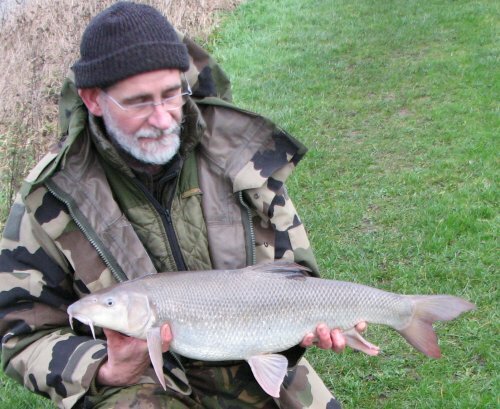 A very pale looking fish, as the photo shows, no doubt because the river had been bank high earlier in the week and heavily coloured. Fish of many species seem to be brightly coloured in clear water (see here) and washed-out in muddy conditions. As the afternoon progressed the water temperature continued rising to 7.8c, and the rod out in the flow kept getting action. A smallish fish was next, followed by an eight pounder, then two fish were bumped off - although I'm not convinced they were both barbel. Finally, as the light was going and I was starting to tidy the gear away I was in again. This fish felt heavy. Heavier than the first fish of the day. It was doing the big fish trick of staying deep and plodding steadily. It plodded upstream until it was under the rod tip, then popped to the surface and into the net. It wasn't the monster I'd expected! Still, at 9-04 it was a satisfying end to the day. This session proved that when you get 'the urge' to do something, you should do it. I'd got up and gone fishing to find perfect conditions. I'd moved swims early because I wasn't happy with my first choice. I'd cast a bait to where I saw a fish roll and had all my action from that spot. Was it luck, skill, experience or instinct that guided my actions? Probably a bit of each.